Yard Sign - Image Creations Inc. Item UNI4769 * Square Shaped Garden Stake, Unisub® Aluminum, 1-Sided, 2.75″ x 6.9″ x .045″. 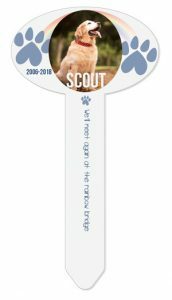 Imprinting area, not including stake: 2.75″ x 2.75″. Specially formulated outdoor aluminum has been tested to resist wind and impact, making it ideal for outdoor artwork, photography, signage and all types of display. Decorate your yard, garden or potted plant with these new outdoor aluminum signs with stakes. They are UV resistant, easy to clean and have a consistent, high gloss finish. Unisub® sublimated stakes are UV resistant when using Sawgrass, Epson or Roland Sublimation inks. Expected life is up to 3 years for sign based art and 2 years for photography based art. Guaranteed. Item UNI4771 * Benelux Shaped Garden Stake, Unisub® Aluminum, 1-Sided, 3.95″ x 6.9″ x .045″. Imprinting area, not including stake: 3.95″ x 2.75″. Specially formulated outdoor aluminum has been tested to resist wind and impact, making it ideal for outdoor artwork, photography, signage and all types of display. Decorate your yard, garden or potted plant with these new outdoor aluminum signs with stakes. They are UV resistant, easy to clean and have a consistent, high gloss finish. Unisub® sublimated stakes are UV resistant when using Sawgrass, Epson or Roland Sublimation inks. Expected life is up to 3 years for sign based art and 2 years for photography based art. Guaranteed. 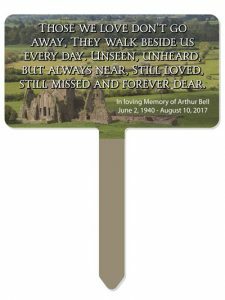 Item UNI4772 * Berlin Shaped Garden Stake, Unisub® Aluminum, 1-Sided, 3.95″ x 6.9″ x .045″. 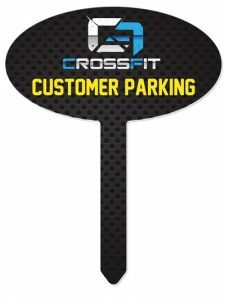 Imprinting area, not including stake: 4″ x 2.75″. Specially formulated outdoor aluminum has been tested to resist wind and impact, making it ideal for outdoor artwork, photography, signage and all types of display.Decorate your yard, garden or potted plant with these new outdoor aluminum signs with stakes. They are UV resistant, easy to clean and have a consistent, high gloss finish. Unisub® sublimated stakes are UV resistant when using Sawgrass, Epson or Roland Sublimation inks. Expected life is up to 3 years for sign based art and 2 years for photography based art. Guaranteed. Item UNI4767 * Rectangle Garden Stake, Unisub® Aluminum, 1-Sided, 3.5″ x 6.9″ x .045″. Imprinting area, not including stake: 3.25″ x 2″. Specially formulated outdoor aluminum has been tested to resist wind and impact, making it ideal for outdoor artwork, photography, signage and all types of display. 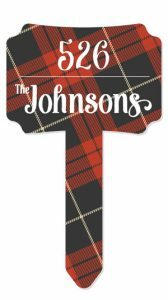 A great way to identify parking spaces, creatively display house or building numbers, show your school or team pride, personalize a gift or bouquet, and identify plants in your spring garden! They are UV resistant, easy to clean and have a consistent, high gloss finish. Unisub® sublimated stakes are UV resistant when using Sawgrass, Epson or Roland Sublimation inks. Expected life is up to 3 years for sign based art and 2 years for photography based art. Guaranteed. 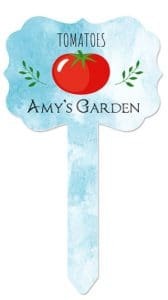 Item UNI4768 * Oval Garden Stake, Unisub® Aluminum, 1-Sided, 3.5″ x 6.9″ x .045″. Imprinting area, not including stake: 3.5″ x 2″. Specially formulated outdoor aluminum has been tested to resist wind and impact, making it ideal for outdoor artwork, photography, signage and all types of display. Decorate your yard, garden or potted plant with these new outdoor aluminum signs with stakes. They are UV resistant, easy to clean and have a consistent, high gloss finish. Unisub® sublimated stakes are UV resistant when using Sawgrass, Epson or Roland Sublimation inks. Expected life is up to 3 years for sign based art and 2 years for photography based art. Guaranteed. Item UNI4774 * Rectangle Yard Sign, Unisub® Aluminum, 1-Sided, 7.75″ x 10″ x .045″ with one stake. Imprinting area, not including stake: 3.95″ x 2.75″. Specially formulated outdoor aluminum has been tested to resist wind and impact, making it ideal for outdoor artwork, photography, signage and all types of display. Decorate your yard, garden or potted plant with these new outdoor aluminum signs with stakes. They are UV resistant, easy to clean and have a consistent, high gloss finish. Unisub® sublimated stakes are UV resistant when using Sawgrass, Epson or Roland Sublimation inks. Expected life is up to 3 years for sign based art and 2 years for photography based art. Guaranteed. 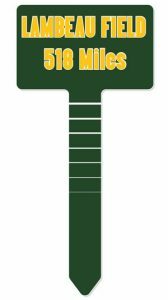 Item UNI4775 * Oval Yard Sign, Unisub® Aluminum, 1-Sided, 7.75″ x 10″ x .045″ with one stake. Imprinting area, not including stake: 7.75″ x 4″. Specially formulated outdoor aluminum has been tested to resist wind and impact, making it ideal for outdoor artwork, photography, signage and all types of display. Decorate your yard, garden or potted plant with these new outdoor aluminum signs with stakes. They are UV resistant, easy to clean and have a consistent, high gloss finish. Unisub® sublimated stakes are UV resistant when using Sawgrass, Epson or Roland Sublimation inks. Expected life is up to 3 years for sign based art and 2 years for photography based art. Guaranteed.